For your very special day we endeavour to provide the highest quality Wedding Car hire and Photography services in all areas of the North East Region including County Durham, Tyne and Wear, Northumberland, Cleveland and North Yorkshire. We have a fine varied selection of cars to cater for all your requirements, all at very reasonable prices. 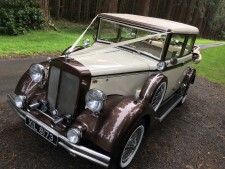 ***To celebrate 20 years in the wedding car business we are offering the next 20 new customers £50 off the hire price (see hire prices page) of any of our 3 Regents, please quote offer 20 when enquiring***. 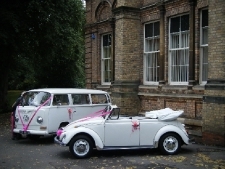 We endeavour to provide the highest quality Wedding Car hire in all areas of the North East Region including County Durham, Tyne and Wear, Northumberland, Cleveland and North Yorkshire. We have a fine varied selection of cars to cater for all your requirements, all at very reasonable prices (please click on Hire Prices on the left) We are proud to be a member of the National Association of Wedding Car Professionals and have been providing our services for 20 years. 1920's Style Regent Laundaulette. This is where old meets new - old styling but with modern day engineering, giving you reliability but with the unique styling of the 1920's. This is the ideal wedding car, perfect for the bridesmaids transport being able to carry up to 6 passengers by using the fold down seating. Then providing a spacious carriage for the brides trip to the venue. 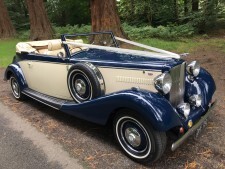 Alternatively its a perfect bridesmaids car should you require two or three matching cars and goes superbly with the Royal Windsor and Jaguar Convertible drophead coupe below. Absolutely beautiful 1930's style Jaguar convertible, finished in navy over cream with sumtuous cream leather interior, completed with deep blue carpets. The doors are wide enough to admit the fullest of dresses with ample legroom for a comfortable journey. This is a perfect match for the Cream/Navy Regent should you require more than one car. Regent finished in cream over bronze This stunning vintage style spacious rear convertible car is the newest edition to our fleet and can seat up to 6 passengers. Internally its beautifully upholstered with cream and bronze piped seating and complementing carpets. A good match for our 1968 Jaguar should you require two cars. We have two Beauford Convertibles, one finished in classic Ivory/Old English White with a navy soft top roof and cream leather interior as pictured at the top of the page with the matching Regent. The other is finished in bright white with a black soft top and cream interior, it matches our white Regent should 2 cars be required. 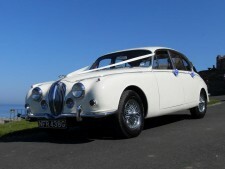 We are very proud to introduce 'Martha' and 'Luther' to our collection of Wedding Cars. Martha is a beautiful 1968 VW Beetle Karman Convertible finished in Candy white with matching white interior. 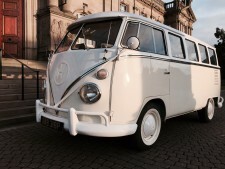 She is well complemented by Luther our 1971 VW Camper van/bus which can be used to transport up to 6 passengers having an L shaped cream leather seating plan. Martha and Luther are available as a pair for £495 or can be booked individually. Click the VW button at the top to see more. 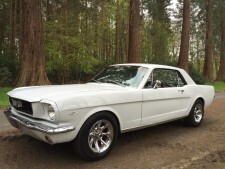 New to our fleet is this stunning Classic 1966 Ford Mustang finished in gleaming white with chrome wheels and contrasting black and chrome interior trim. A real head turning American 5 Litre V8 muscle car all the way from Illinois. Available for hire at £295. 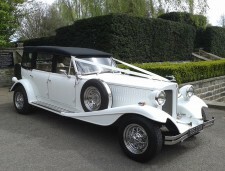 You can see more pictures and check wedding car hire prices and view previous customers comments by clicking the various buttons on the left and top of the page. We have also included some popular Wedding Guide Information pages. We hope you find them useful. Should you wish to personally view the cars or have any questions then please do no hesitate to contact us by phone, e mail or text. We were contacted by the Scottish Spina Bifida Association to provide a car for a 1920's Charity Event with Duncan Bannatyne at Bannatynes Hotel in Darlington. 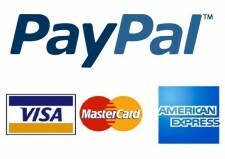 We didnt hesitate to assist in this worthwhlie cause.